Home » GROW, GALUSHA A. Elected to Congress in 1851 as a Free Soil Democrat interested in the use of public lands, Grow switched to the Republican Party ca. 1857 and remained in the House until he was defeated for re-election in 1863 due to the changing politics of his state. He served as Speaker of the House 1861-63, during which time he accomplished the crowning achievement of his career, the enactment of the homestead act for which he had so long labored. 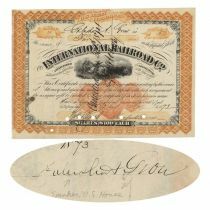 After his defeat, he became active in various business enterprises such a lumber, oil and railroads, and served as president of the Houston & Great Northern Railroad, 1871-75. After many attempts, Grow was finally re-elected to Congress, and served 1893-1903. 1872, Texas. Stock certificate for 5 shares. Orange/Black with imprinted revenue at lower center. Vignette at center of cowboys driving cattle. Issued to and signed on verso by Galusha A. Grow (1822 - 1907) U. S. Politician, lawyer, Speaker of the House of Representatives from 1861 - 1863. Ink spot at lower left by company seal, otherwise fine. Pen and hole punch cancelled, neither affect Grow's signature.